Let’s just say that now that I am home from the HOPE IS TOUR I have had some lovely down time writing music and creating art. With Christmas coming this might be a good time to think about giving someone you love a truly extraordinary gift : the gift of original art. I have been just loving my Friday painting days ( when I am home! ) and have managed to create about 8 new paintings since my return to Edmonton. Most of these are acrylic on canvas but I managed to complete a couple of new watercolours too. These are moderately priced and if you are seriously interested but worried about the cost I am happy to receive instalments. So speaking of ART I have had a couple of neat things happen recently in connection with my work. When we lived in Calgary 14 years ago we loved visiting ( and purchasing from…) Junktiques owned by David and Marie Kaufman. David is such a talented carpenter and I also thought he would make an excellent subject for a painting so one day I bombarded their shop so I could take some photographs for a future portrait . I did a watercolour in 1993 of David hard at work and put it in my portfolio for future framing. Jump ahead to 2014 and my husband and I finally reconnect with Dave and Marie to inquire about having some ‘junktiques’ built for our soon-to-be renovated home. We had been saying for years that the four of us should get together when we’re in town but we never did make it happen as is so often the case. Well, finally , we all decided to choose a date for dinner as we would be visiting Calgary again soon. 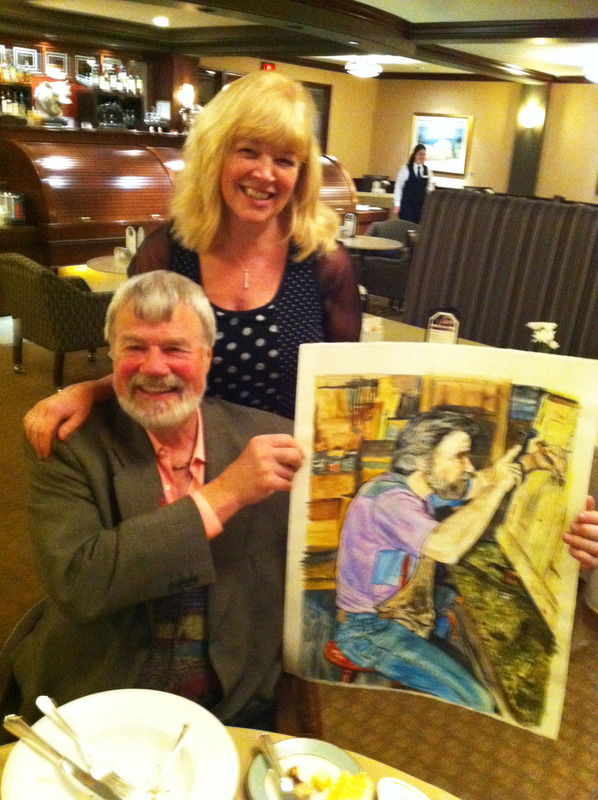 I remembered that long ago painting ( that we never could afford to frame at the time) and I decided to gift it to David and Marie at dinner. I felt very honoured to see the tears of joy that Dave and Marie shed and I am so glad that I was able to give them this gift. When I first saw the painting of the prairies , I couldn’t stop looking ( and re-looking) at it – it called to me. It so reminds me of my Dad – a prairie farmer ( for many years, and always at heart ) . And so comes many memories of riding the tractor/combine with him, and of his stories…. P.S. He went to ” prairie heaven ” – 25 years ago !